We adore apple crumbles, and at this time of the year both newly fallen apples and blackberries are available and plentiful - at least they are here in Ireland. Today I used apples that had fallen from our apple tree yesterday. We just have 2 apple trees, one is a very old cooking apple (the tree is at least 70 years old), and the other is a 12 year old 'Russet' (a traditional old fashioned small English eating apple, which tastes slightly nutty). This recipe for apple crumble can be used with either gluten free flours, such as Dove Farm's gluten free plain flour, or normal wheat plain flour. I make the gluten free option, as I am gluten intolerant. Whichever type you use, the result is pretty similar, as the butter is there to bind the flour and sugar together. 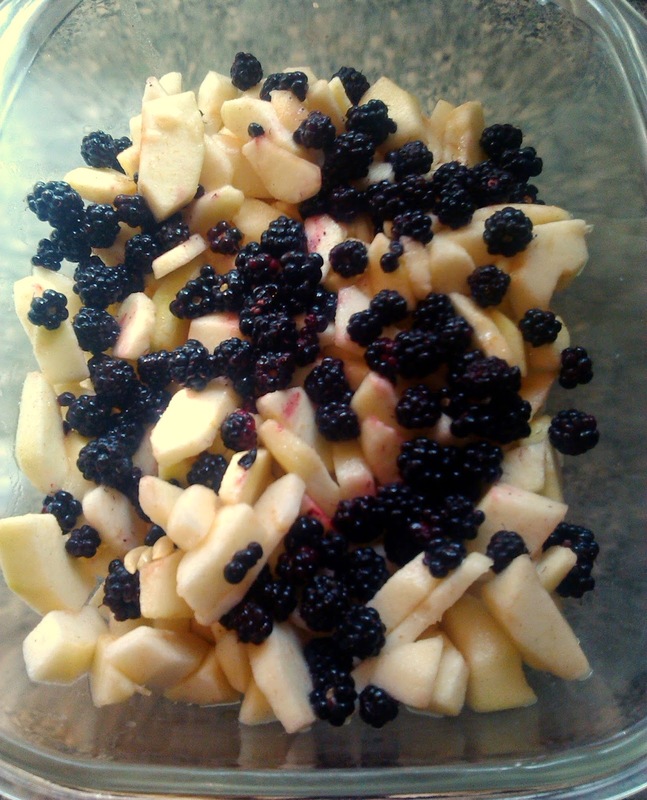 Today I added a large handful of blackberries to the sliced up apples. This not only adds a very yummy taste, but alters the colour to a gorgeous dark pink, depending on how many blackberries you use. I also love cinnamon in the fruit part of an apple crumble - but this is easily left out if you aren't into cinnamon. I add flour to the apples as this gives the juice a slightly thicker, syrupy consistency, which is heavenly. Anyway, here is the recipe I used today - This makes a medium sized crumble which is plenty for two people, including copious seconds ! 1. Put the lemon juice into a large mixing bowl. Peel, core and evenly slice the apples, removing any bruised or damaged bits. As you are slicing them, put them into the lemon juice, mixing with a wooden spoon to cover them. This helps to prevent the apples going brown, as well as adding to the taste. 2. Into the bowl with the apples, add the cinnamon, sugar and flour. Mix this around, gently, until the apple slices are all covered fairly evenly. 3. Put the apple mixture into a high sided, ovenproof, pie dish - I use Pyrex casserole dishes. 4. 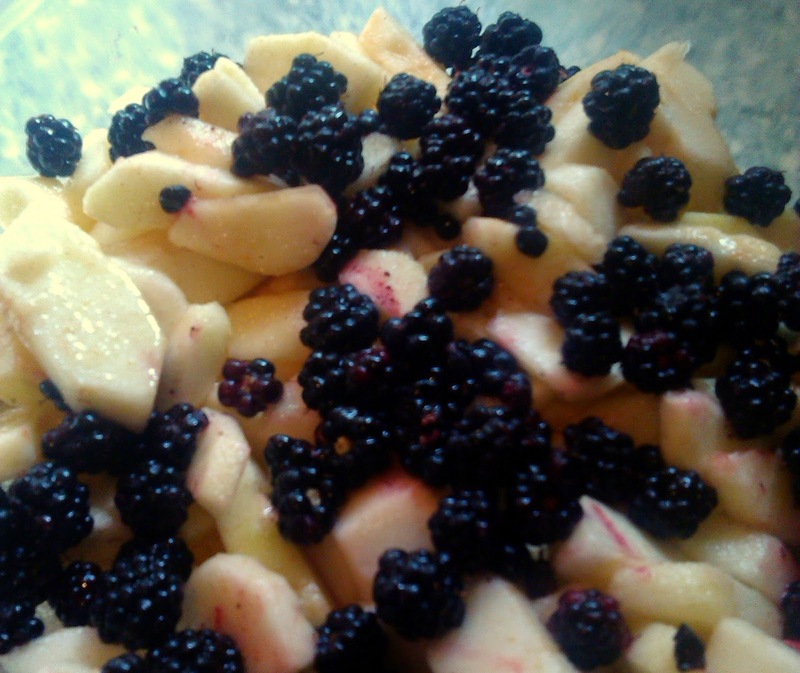 Sprinkle the blackberries evenly across the top of the apples. Cover the dish with a cloth, or a lid if you have it. 5. Put the flour and butter into a large mixing bowl, making sure that the butter is in no more than 1/2 inch lumps. 6. 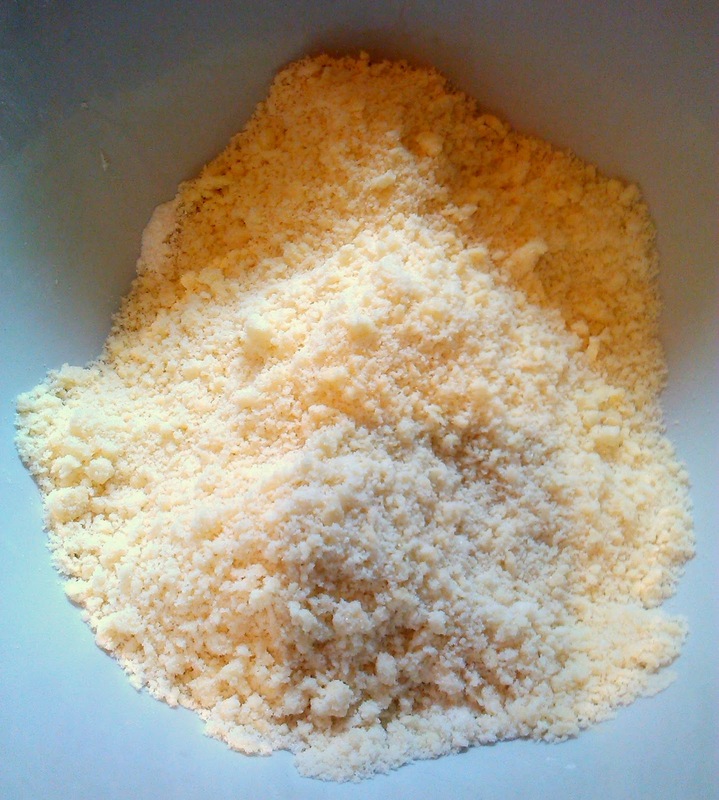 Using your fingertips, 'rub' the butter into the flour until it resembles breadcrumbs. 7. Mix the sugar into the crumble mix, gently. 8. Spoon the crumble mix evenly on top of the apples which are already in the ovenproof dish. 9. Place the dish into the centre of the preheated oven. Cook for 35-45 minutes (the crumble is best when just turning a light brown, but you may prefer it darker or lighter). 10. Serve hot from the oven, with warm custard. Also great cold the next day with cream ! This crumble recipe will also freeze extremely well for up to 4 or 5 months. Alternatively, you can freeze the sliced apples covered in lemon juice in a bag, and the washed blackberries in another bag, for future use. Also, why not make double the dry crumble mix, pop half into a plastic bag or container, and freeze it !! Remember to label what is gluten free what what isn't !